Hello everyone! Happy Wednesday/middle of the week! So sorry I dint get a chance to post yesterday. The Hubs took most of our electronics (and all of our chargers) on his business trip so I had to borrow a few items and find a few hidden in the house in order to get some technology up in here. 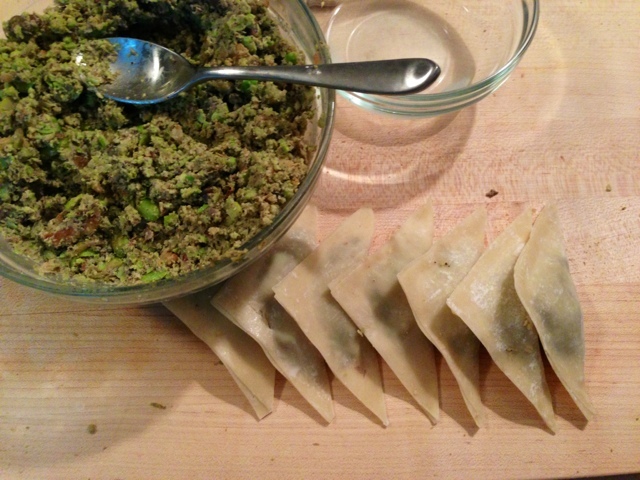 Anyway, I wanted to share with you a recipe that I made a few days ago, edamame and walnut wontons. 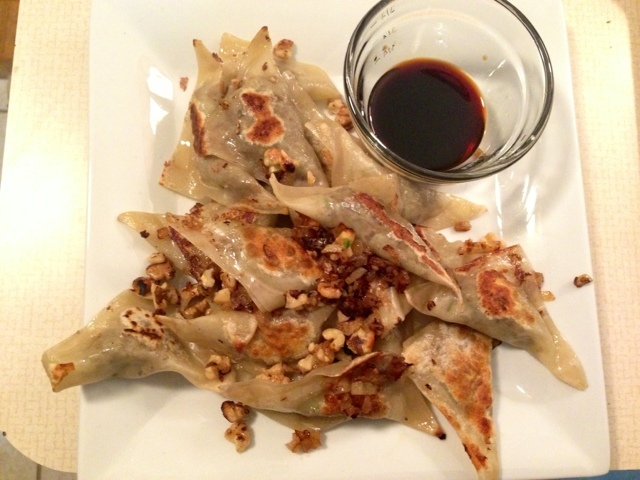 They are kind of like Asian style steamed dumplings, but they have a vegetarian mixture in the middle. Both the Hubs and I really enjoyed them, and I think you will too. It is so hard to get Travis to eat anything without meat (he is not a vegetarian at all) much less without cheese! I was in shock with how much he liked them, and I kind of consider it a personal accomplishment! 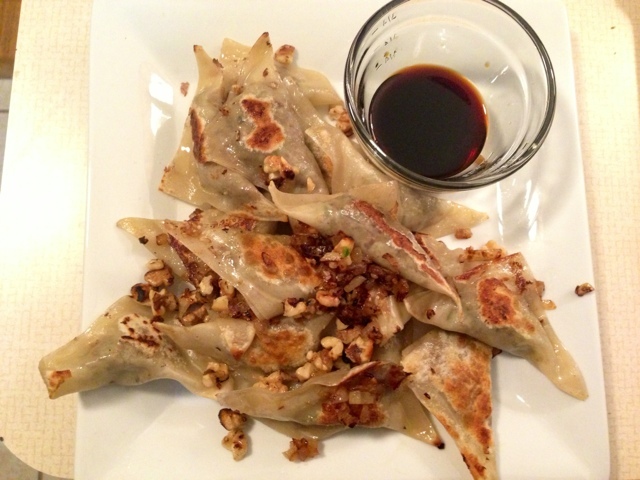 Like I said, the recipe is vegetarian, however it is not vegan because of the wonton wrappers, so If you are able to find vegan wrappers then it totally could be vegan. This recipe was adapted from Sala of Veggie Belly. I have decided I will make these again in the near future but change up the fillings with different things. 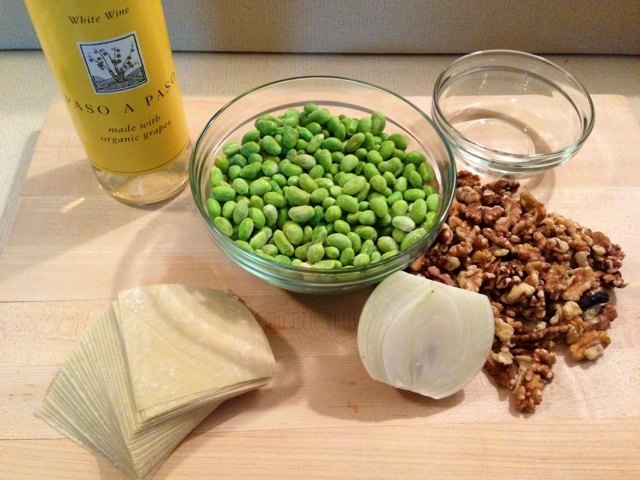 This recipe does make a whole bunch because I wanted to use the whole bag of edamame and the dumpling wrappers because they were about the expire so feel free to cut it in half (I tripled the original recipe), but they apparently freeze very well. I made the whole recipe and ended up with about 50 dumplings; I have frozen some but haven't attempted reheating them yet, so I will keep you posted on that. I hope you have fun making these and even more fun eating them! Enjoy! Dice the onion and garlic finely. Add to a pan with a bit of oil (I used coconut oil) and saute on medium heat until onions are translucent. Add the brown sugar as the onions start to turn translucent in color to help with the caramelizing process and continue to cook them down until they start to brown. Remove from the heat and set a side, wiping the pan clean. Place the walnuts in the pan. Toast the walnuts on medium heat until they are lightly browned. 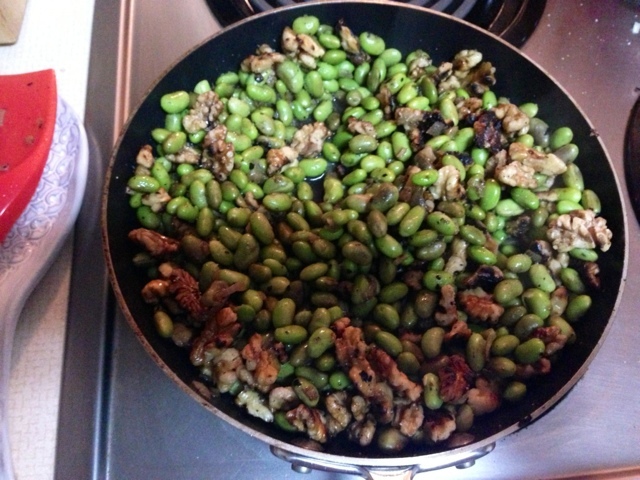 To the pan, add frozen, shelled edamame, white wine, salt and pepper. 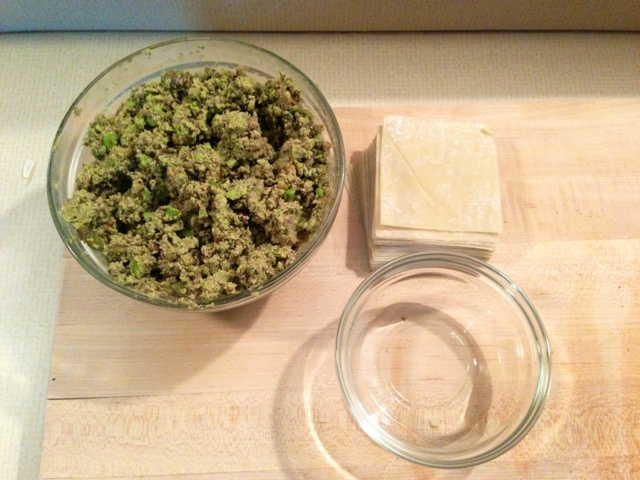 (Make sure you season the mixture well, it makes a big difference in the final result!) 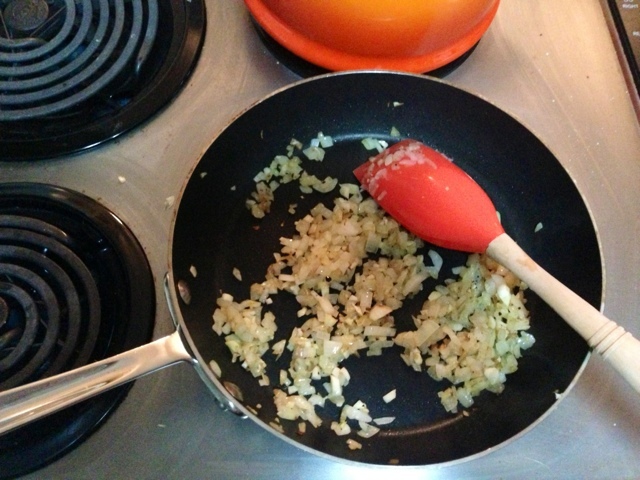 Add the onion and garlic mixture. Let the wine bubble away on medium heat, about 1 minute. 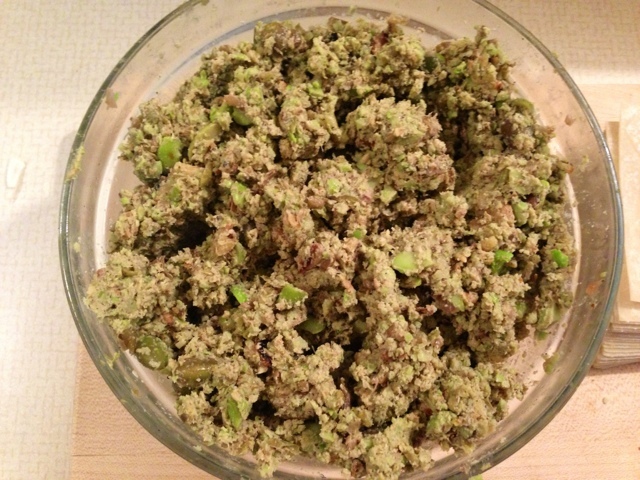 When the wine has evaporated, transfer the walnut-edamame mixture to a food processor (I used a blender because that is all I had and it was difficult. I did not get the mixture completely smooth, but the texture did not bother us). Blend into a smooth paste. 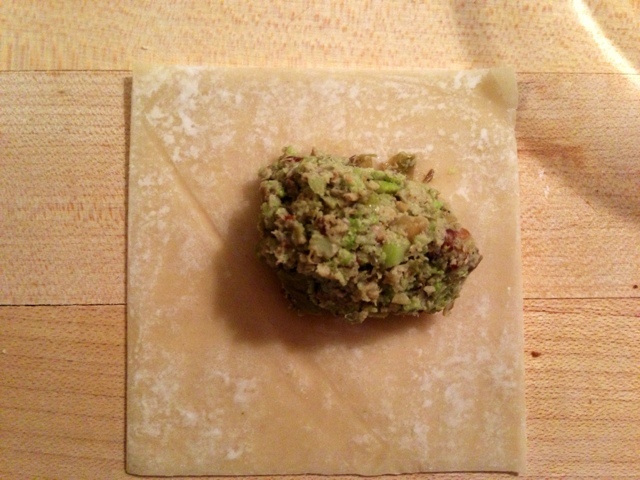 Open the package of wontons on a clean work surface. 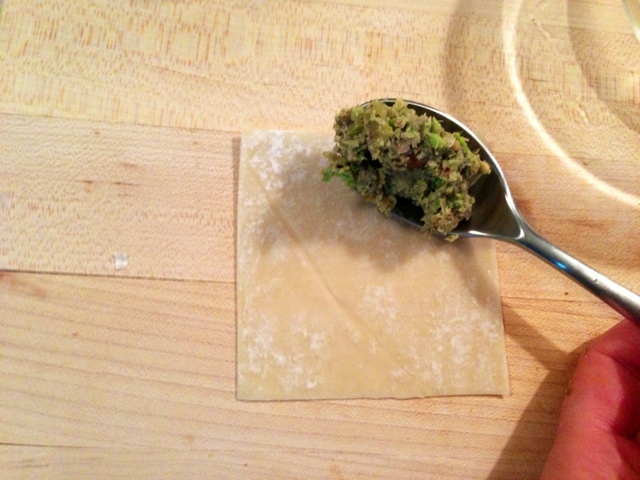 Take one wrapper and place about a teaspoon of the mixture onto the wrapper (see photos below). Get a small shallow bowl of water, room temperature is fine. 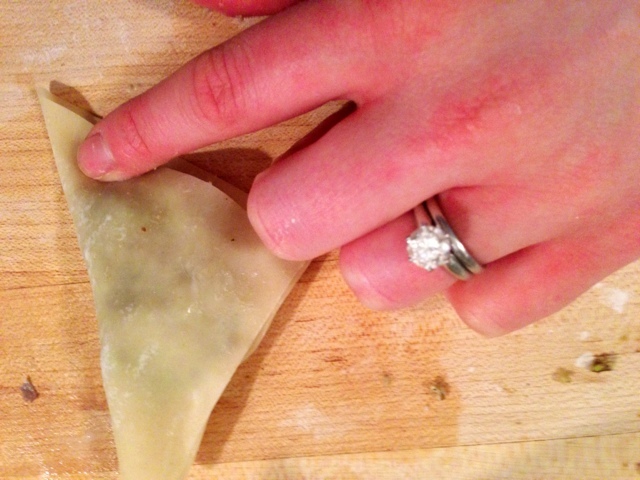 Dip your finger in the water and coat all four sides of the wonton wrapper, drawing a square on the outer edge around the filling. This will help the edges to stick to each other. 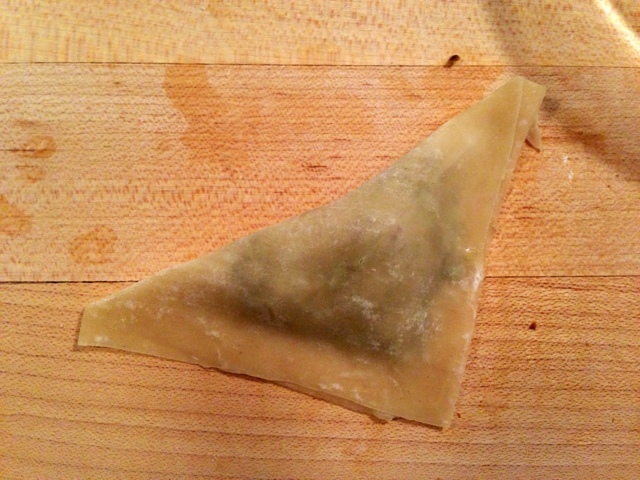 Fold the wonton in half over the mixture to make a triangle. Press the edges down to seal the filling and make sure none is leaking out. Repeat for all the wontons until filling is gone or you get too tired of making them :) When you are finished with the wontons, heat a large skillet that has a lid large enough to cover it over medium high heat. Put about 1 teaspoon of oil (once again I used coconut oil) into the pan. When the oil is hot, add enough dumplings to cover the bottom of the pan but do not overcrowd otherwise you will not be able to get them brown and crispy on each side. Once you have the wontons in the pan, quickly add 1 tablespoon of water too the pan and cover with a lid (the oil may spit up from the pan, so be careful). 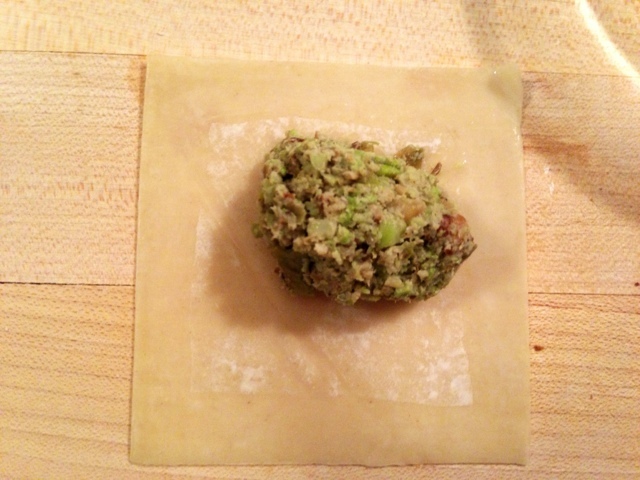 This step will steam the inside of the dumplings while still allowing them to get crispy on the outside. After about one minute remove the lid and flip each dumpling (they cook very fast so keep an eye on them) and leave uncovered for another minute. 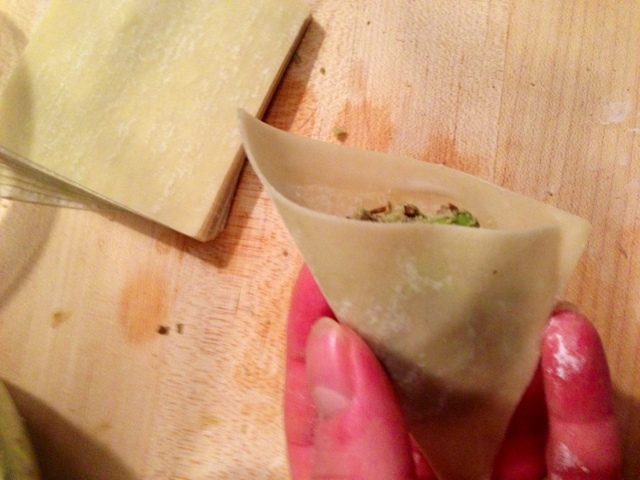 Repeat this step until you have cooked all the dumplings you want for the night and freeze the remaining uncooked wontons. Serve with soy sauce for dipping and enjoy!!! I sure will, thanks so much for finding me!